Lady Sings It Better is an impressive cabaret group of four women, who are performing in Melbourne as part of the Melbourne International Comedy Festival, that deliver a clever mix of musical talent and entertainment, with underlying feminist themes and hard-hitting pop culture critiques. The ladies, Maeve Marsden, Libby Wood, Annaliese Szota, and Fiona Pearson, take songs that have originally been sung by men, and then uniquely transform them with their own interpretations. The occasional addition of violin and kazoo, as well as miniature trumpet and trombone, reinforce their musical excellence and comical atmosphere. The pianist, Hayden, and drummer, Lauren, are equally as talented in their compelling performances. The opening act, a mash-up combining lyrics from The Wiggles and Jason Derulo’s ‘Wiggle,’ introduced stunning harmonies that hinted at the varied set-list that was to follow. The women were dressed in Wiggles costumes, complete with labels ‘The Ladies,’ which added to the absurdity of the sexist lyrics. The rest of their performances included Baha’s ‘Who Let The Dogs Out,’Chris Norman’s ‘Mustang Sally,’ and Bruno Mars’ ‘Gorilla.’ The hilarious dance moves which likened women to animals, became a comedic tool to tear away at the seams of misogyny buried within musical culture. Also included were songs such as Fountains of Wayne’s ‘Stacey’s Mom,’ with their appropriation into a sweet and romantic solo making the lyrics all the more creepy. The hits Hunter & Collectors ‘Throw Your Arms Around Me’ and ‘My Sharona’ by The Knack were also performed. The songs, which have been generational hits, gave me flashbacks to childhood sing-alongs with family, making them particularly unsettling. The pervasive lyrics reinforced the ingrained sexism within pop culture, often unrealised and side-swept through catchy choruses. The disturbing revelation that we grow up, partake, and unknowingly encourage these degrading themes is skilfully communicated. The playful performance makes feminist undertones accessible to men and woman alike, with audience engagement at a high and constant laughter filling the room. The lyrics, kept as originally written, are sung with cheeky expressions and wide grins, feeling almost empowering through the comedic interpretations. During a quick costume change, the pianist, Hayden, sung the solo ‘Dear Future Husband’ by Meghan Trainor. The switch to a male singing a song originally written by a female was a superb and enjoyable addition. The song reinforced that gender roles are fixed into both sexes, and that it is a societal issue effecting both men and women. To conclude the performance, the song ‘Dive’ by Usher was performed. The four-lady troupe hilariously declared him a feminist for his devotion to female sexuality, with his oceanic metaphor acting as a strange and explicit comparison to female arousal. The show ended with thunderous foot stamping and clapping from the audience, begging for an encore. Lady Sings It Better is more than just a musical performance; it is a political statement that is cleverly and enjoyably expressed through comical renditions. The power of misogynistic lyrics are taken away and transformed into enlightening and thoughtful compositions. This show is not one to miss. Catch them in Melbourne at The Butterfly Club until April 19th, before they head to Sydney in May. Full-priced tickets are $38, available at the door or online. 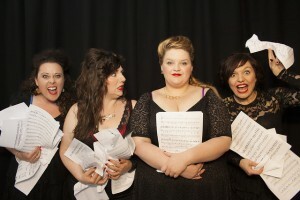 This entry was posted in Arts, Comedy, Theatre and tagged cabaret, comedy, MICF, Review. Bookmark the permalink.